Nothing warms the soul like a giant hunk of meat with a hearty sauce. A shank — be it beef, lamb or veal — does just the trick. 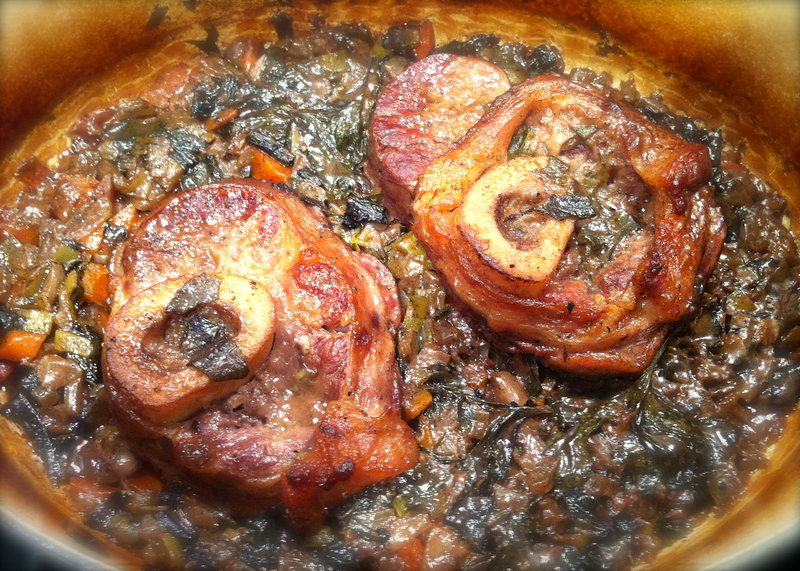 For maximum taste, brown the shanks first and then braise them with lots of liquid to tenderize the meat. The slow cooker works great for this. But if you have a Dutch oven and the time to spare in the evening, after turning your oven on for a couple of hours, you certainly won’t be disappointed with the end result. My favorite type of shank is veal. A little more expensive than lamb and a lot more expensive than beef, it also has a rich quality that makes the meat the center of attention as opposed to the sauce. 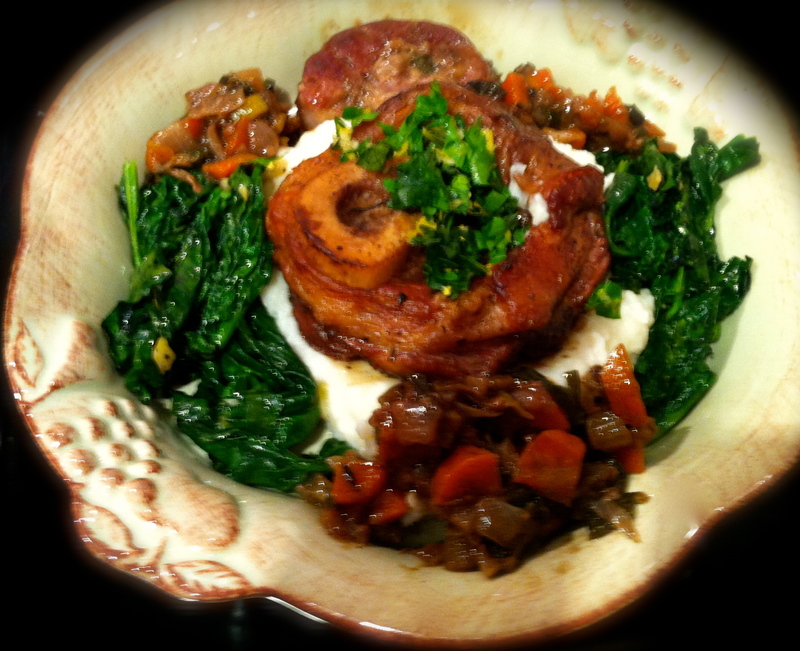 “Osso Buco” is also an impressive sounding dish that is fairly simple to make. 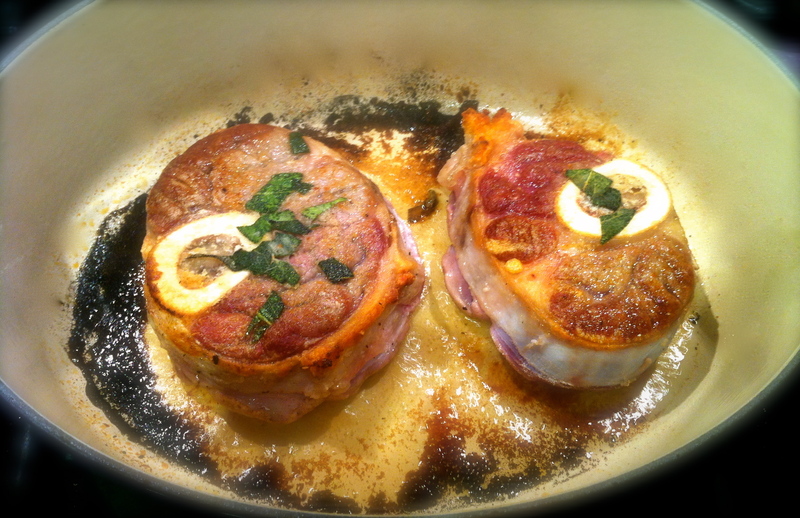 You will want cuts of veal that are thick and meaty with smaller bones, or else you will need 4 shanks instead of 2. You can use a veal demi-glace for the braising liquid, but it’s pricey ($30 for a jar in Williams-Sonoma), and you don’t really need it to have an amazing meal. In this recipe, you can substitute a dry white wine for the red if you prefer. Some people like to add tomato to the sauce, but I think the sauce has more depth without the acid. I also used vegetable stock to let the meat flavors come through. This turned out so delicious that the plates were wiped clean. Next time, I’m making enough to get me through at least 2 cold nights. Preheat oven to 350 degrees. If not already done, prep the veggies. Rinse the shanks and pat dry. Add salt, pepper and sage to the flour and stir. Dredge the shanks in the flour. 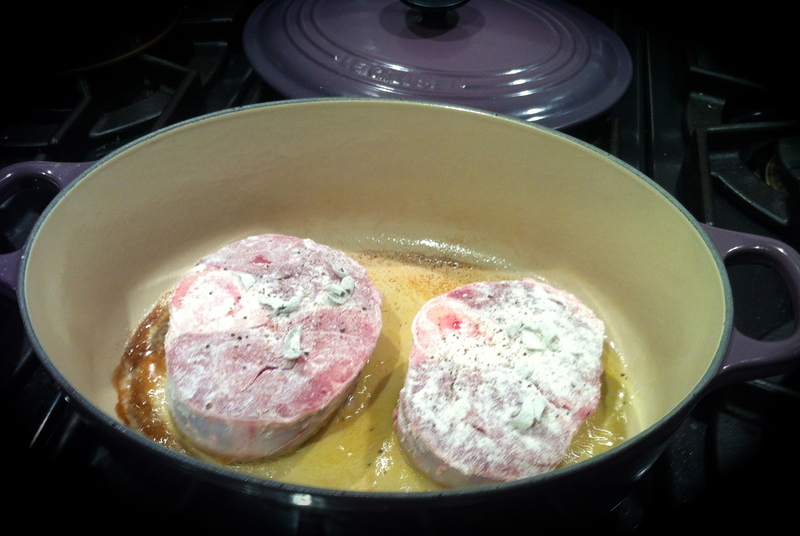 In a Dutch oven (or oven safe pan), heat the olive oil over medium high. Place the shanks in the oil and brown for about 4 minutes. Turn the shanks and brown the other side for about 4 minutes more. Remove the shanks from the pan and set aside. 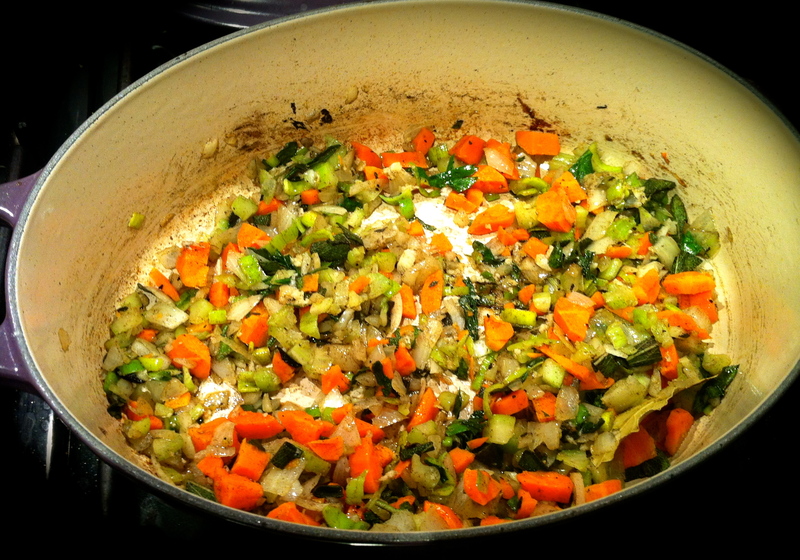 Lower the heat to medium low and add the carrots, celery, onions, leeks and garlic to the pan. Saute for about 5 minutes or until the onions are translucent. 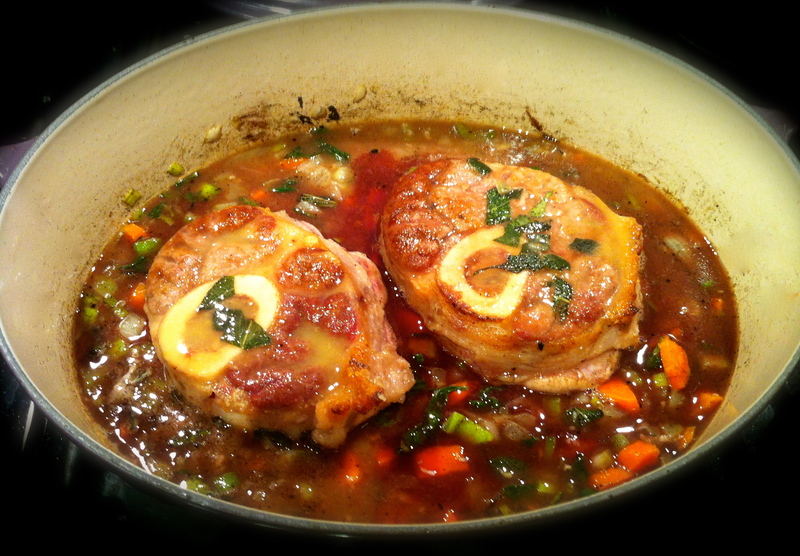 Add the veal shanks. Pour the wine and stock over shanks. There needs to be enough liquid to go halfway up the shanks. Add bay leaf, as well as fresh herbs, salt and pepper as desired. Increase heat to medium-high and boil. In the meantime, make the gremolata: combine parsley, lemon zest and garlic. Set aside. Continue braising the shanks for another hour or so until meat is falling away from the bone. This should not take less than 2 hours and may be about 2 and 1/2 hours in total. Remove the shanks from the pan and discard the bay leaf. 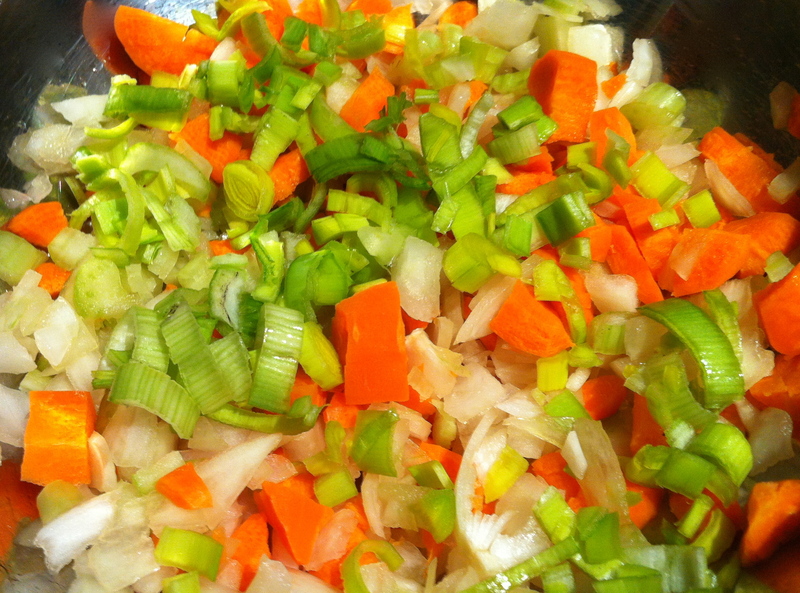 You can serve the shanks with the veggies as is or you can puree the veggies with some stock for a sauce if desired. 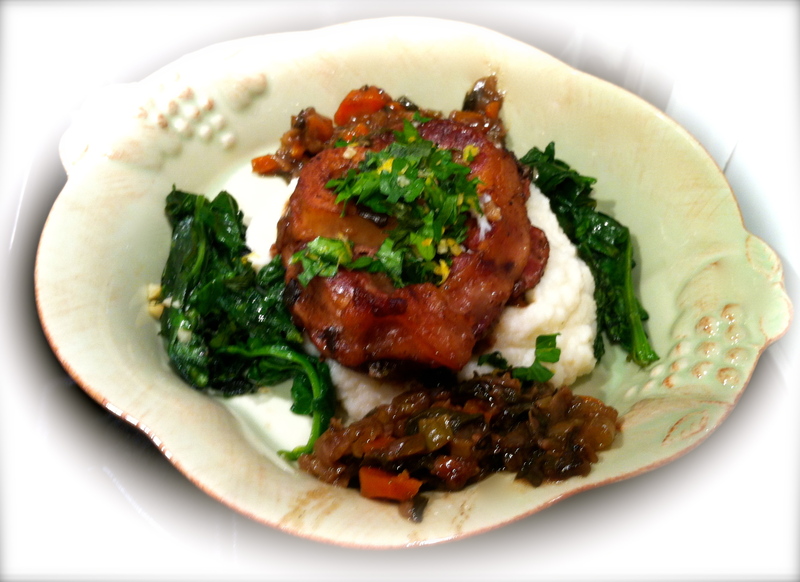 Top shanks with the gremolata and serve over some creamy polenta or cauliflower puree with some greens. To drink: serve the wine you cooked with, of course. Or a bourbon or rye drink also would be nice.